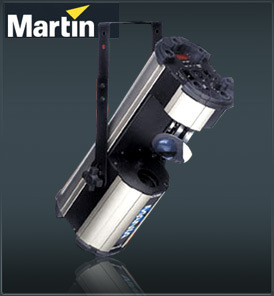 The Martin Mania SCX500 is the extraordinary new 150W halogen scanner in the Mania series that challenges the status quo of mobile scanners. Compact and light for such a powerful and feature-rich light, the SCX500 is built tough for life on the road, with total safety approvals to get you the ticket into any venue. With 15 gobos plus open, 15 colors including white and 5 mixed colors, the SCX500 powers out shows like the big boys but with all the convenience and savings of its class. A split color option also adds to the SCX500’s array of colors and midair effects that will keep them focused on the show, whatever the occasion. Combine this performance with the unmatched value every fixture in the Mania series has, with at least 500 hours of lamp life – and you are looking at incredible savings over the competition, whose lamps average only 50-200 hours of life.